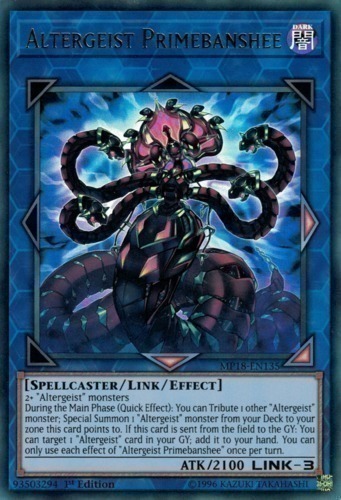 During the Main Phase (Quick Effect): You can Tribute 1 other "Altergeist" monster; Special Summon 1 "Altergeist" monster from your Deck to your zone this card points to. If this card is sent from the field to the GY: You can target 1 "Altergeist" card in your GY; add it to your hand. You can only use each effect of "Altergeist Primebanshee" once per turn.